1.e4 c5 2.¤f3 e6 3.d4 cxd4 4.¤xd4 a6 5.Ґd3 Ґc5 6.¤b3 Ґa7 7.Јe2 d6 8.Ґe3 ¤c6 9.f4 ¤ge7 10.0–0 0–0 11.c3 b5 12.¤1d2 Ґxe3+ 13.Јxe3 ¦b8 14.ўh1 Јb6 15.Јe2 White acquires a slight edge which is standard for Paulsen variation. It stands to reason that transposition into an equal endgame is not tempting for him at all; Veselin's far-reaching plans include an attack on the K-side in view of the fact that black pieces are situated far from their king. 16.a3! A necessary prophylactics against probable b5-b4; now on this advance White is at any moment ready to the capture with the c-pawn and then to play a3-a4 securing obvious positional advantage. Antiposotional is 16.a4, even if in view of 16...bxa4, and pawn weaknesses on the Ј-side at the very least equalize each other, and the weakness on b2 and instability of b3-knight may well be more weighty that the weakness on a5 at that. 16...Ґd7 17.¦f3 This move looks rather "rough" and somewhat inflexible; I would prefer 17.¦ad1, keeping all the ideas for the future. 17...¤g6! 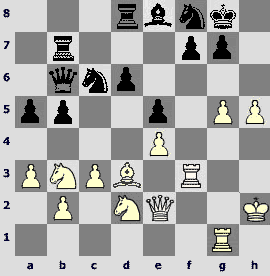 Reminding White of the dark-squared weaknesses in his camp and preventing transfer of the rook to h3. 18.g3 Forced, or there may follow e6-e5. 18...¦fd8 A positional and slow play. Vassily misses his chance to deliver a couple of original hits: 18...a4! 19.¤c1 f5! Of course such a pawn play along light-colored squares becomes possible solely due to the fact that the rook has stuck on a1, and the g2-g3 move has weakened the K-side light-colored squares. Apparently Vassily, being a competent positional player, simply never considered a possibility of moving a single pawn to a light-colored square in such kind of a structure, let alone moving two of them in a row in this way. 19.¦d1 ¤ce7 With this move Black takes under his control the a4-square, on 19...b4 there would follow 20.cxb4 axb4 21.a4 with white advantage. 20.h4! 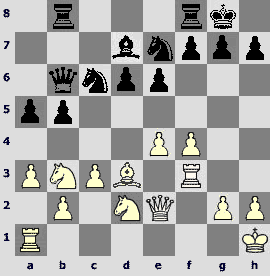 The only way to develop the initiative on the K-side; it is necessary to drive the knight off the g6-square. 20...h6 21.ўh2 Ґe8 22.¦g1 ¤c6?! Impossible to understand why Vassily has chosen to reject his prepared move 22...b4 with fine counterplay. 23.h5 ¤f8 24.g4 White attack becomes threatening, there are only two drawbacks in his position, namely the f4-square weakness and the poor position of his knights. 24...e5 It takes a computer, not a human being, to venture on 24...f6 25.g5 Ґxh5 26.gxf6 g6. Strange as in may seem I can see no direct mate, for example 27.Јe1 Ґxf3 28.¤xf3 e5 29.f5 g5 30.¤xg5 hxg5 31.¦xg5+ ўf7, and black king escapes to the Ј-side. 27.Јf1? A mistake- the queen occupies a square, which is in mast cases necessary for the knight. It seems worth its salt to make Black decide his position about K-side dark-colored squares: 27.h6! Now if Black plays 27...g6 by analogy with the actual game, then after 28.¤f1! b4 29.axb4 axb4 30.Ґc4 White acquires strongest initiative. 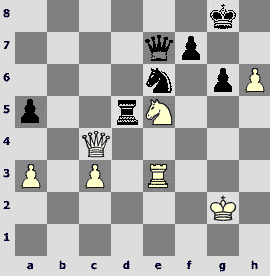 None the better is 27...¤e6, after 28.hxg7 ўxg7 29.Јf1 ¤f4 30.¦xf4 exf4 31.Јxf4 White has an attack. 27...¤e6 28.h6 Hardly dangerous for Black is 28.g6 ¤f4 (White's attacking ideas become clear in the variation 28...fxg6 29.a4!) 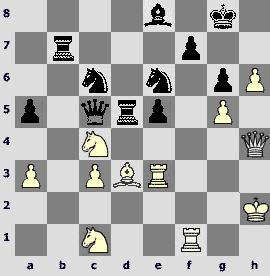 29.gxf7+ Ґxf7, the f4-knight is much too strong. 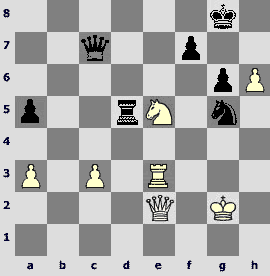 28...g6 28...¤f4 is an alternative permitting to uncover the Black king, so Vassily's choice is more justified. 29.¤c1 Јc7 Another possibility is 29...¤e7 preparing d6-d5. 33...d5! 34.exd5 ¦xd5 35.¦e3? 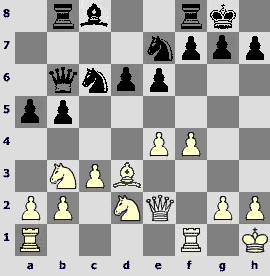 A move similar to 27th in this game – major piece takes its stand on a square meant for a knight. Now White overtakes the advantage, the correct way would be 35.Ґe4 ¦c5 36.¤e3 ¤f4 37.¤g4 ўh8 38.¤f6 – the position is rather complex and double-edged, but the advantage is most likely White's. 36...¦b2+! Being strongly pressed for time, Vassily Ivanchuk still plays superbly, simplifying the game for his benefit. 37.¦f2 Yet better is 37.Ґe2, although nobody would want to get pinned on his own free will. 37...¦xf2+ 38.Јxf2 Јe7! Avoiding the child's trap 38...¦xd3? 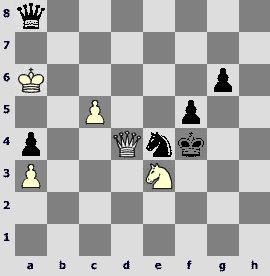 39.h7+ ўxh7 40.Јh4+, and the c4-knight is defended. 39.Ґe4 ¦d1 40.Јc2 ¦d8 Now that the opening battle smoke has lifted it looks like White might as well as cry over his fate – there is not a trace of harmony in his pieces' deployment, the pawns on a3 and с3 are weak, and two other ones on g5 and h6 wait for their turn to be grabbed. 41.¤d3 ¤xg5! The best choice, which nevertheless has taken too much of Vassily's time- about 40 minutes out of an hour allocated for 20 moves. It is unexpected that in the variation 41...Јxg5 42.Јg2 Јxg2+ 43.Ґxg2 f6 44.¤f2 Black fails to comfortably defend the f6-square from being invaded by the white knight. 42.Ґxc6 Ґxc6 43.¤dxe5 Јf6! There are many other computer continuations in this position, but Vassily chooses the most reliable way. 47...¤e6 Knight leaves a very fine position, stronger is 47...Јd6! 48.¤c4 Јc6 49.ўg1 ¦f5! 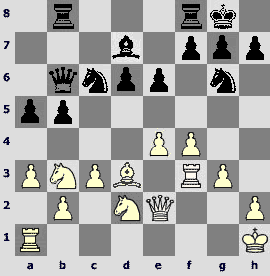 50.¤e5 Јd5 51.c4 Јd4 arranging a decisive attack. 49.ўg3!! Veselin Topalov is exceptionally persistent in finding the only unobvious opportunity to keep up the resistance. 49...Јg5+ The most natural, but not the strongest way is to take the opponent in the reverse 49...¦d1!, which White would not survive. 53...a4! 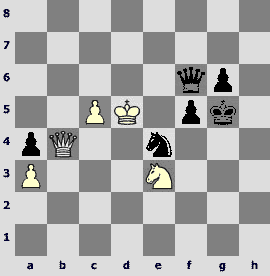 On a4 pawn stands better than on a5, and White has no useful moves, but no zugzwang either. 54.Јe3 Јe7! 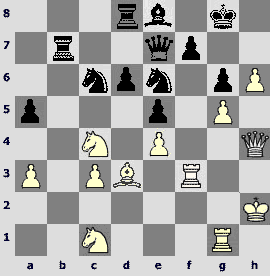 55.Јc3 Јc7+ Vassily fails to find winning 55...¦xf3+ 56.ўxf3 Јh4 57.¤f6+ ўxh6 58.¤g4+ ўh7 59.¤f6+ ўg7 – White has no dangerous discovered check. 56.ўf2 ¦xf3+ 57.Јxf3 Јc5+ 58.¤e3?! In a knight endgame forcedly ensuing after 58.ўg2 f5 59.Јb7+ Јc7 60.Јxc7+ ¤xc7 61.¤f6+ ўxh6 62.¤d7, White is close to a draw – black knight is passive. 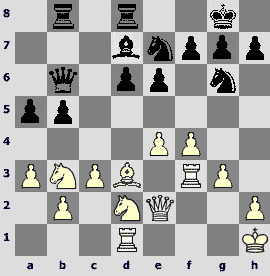 58...f5 59.Јb7+ ўxh6 60.Јd5 Јe7 This version of a knight endgame is better for Black in comparison with the previous one - 60...Јxd5 61.cxd5 ¤c5 62.¤c4 ўg5 63.ўe3 ўf6 64.ўd4 ¤b3+, but he is not completely sure to win, so Vassily prefers to keep queens on the board. 61.Јe5! Јh4+ 62.ўf1 ¤g5 63.Јh8+ ¤h7 64.Јe5 ¤f6 65.ўe2! ўg5! 66.c5 Јh5+! 67.ўd3 Јf3 68.ўc4 Јb7?! Stronger is 68...¤e4! aiming at the white knight. 69.Јc3?! 69.Јg3+ ўh6 70.Јd6 allows facing the future confidently: 70...Јb3+ 71.ўd4 Јb2+ 72.ўc4 Јa2+ 73.ўb5 Јb3+ 74.ўc6 ўg5 75.Јd2 with excellent chances for a draw. 72...ўf4?! This most natural move looks suspiciously like a mistake, on f4 king will soon start to be checked. Under last decisive time pressure it is extremely difficult not only to find an exchange operation, but also to make a decision to transpose into a queen endgame which is not so simple: 72...¤c3+! 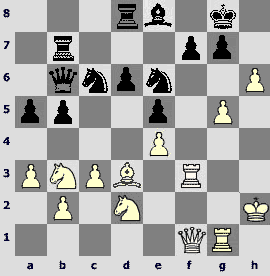 73.ўc4 Јe6+ 74.ўxc3 (losing at once is 74.ўd3 Јxe3+ 75.ўxe3 ¤d5+ 76.ўd2 ¤xb4 77.axb4 ўf6) 74...Јxe3+ 75.ўc2 Јe2+, and the f-pawn should decide the outcome. 73.Јd4 Јf7+ to a simple draw leads 73...Јxd4+ 74.ўxd4 ¤xc5 75.¤d5+ ўf3 76.ўxc5 g5 77.ўd4 g4 78.ўe5; the last chance to win is transposition into a knight endgame after 73...Јa6 74.¤c4 Јa8+ 75.ўe6 Јc6+ 76.ўf7 Јxc5 77.Јxc5 ¤xc5 78.ўxg6, although draw is the most probable outcome here too. 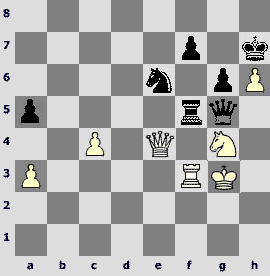 White escapes, passive position of the knight and king notwithstanding. Playing as White one must attack. Nothing to write home about for the young Norwegian. Alexander won at last, and in his patented style at that, putting his opponent off the habitual strategic estimates and making him think unconventionally. Peter Leko had been a worthy opponent, but, being pressed for time, began making mistakes. In one of the boring variation of Petroff Defense Vishi Anand, having found himself in a bit worse but most probably drawish position, unexpectedly made a mistake, ceding a pawn on move 26. In five moves Peter Svidler paid him back in kind, for some reasons refusing to defend Vishi's present. Apparently, Svidler himself has never thought it possible to beat Anand in Petroff Defense.